MacConnachy Square comes to vibrant life as villagers gather at the start of "Brigadoon," playing outdoors at Musicals at Richter in Danbury. 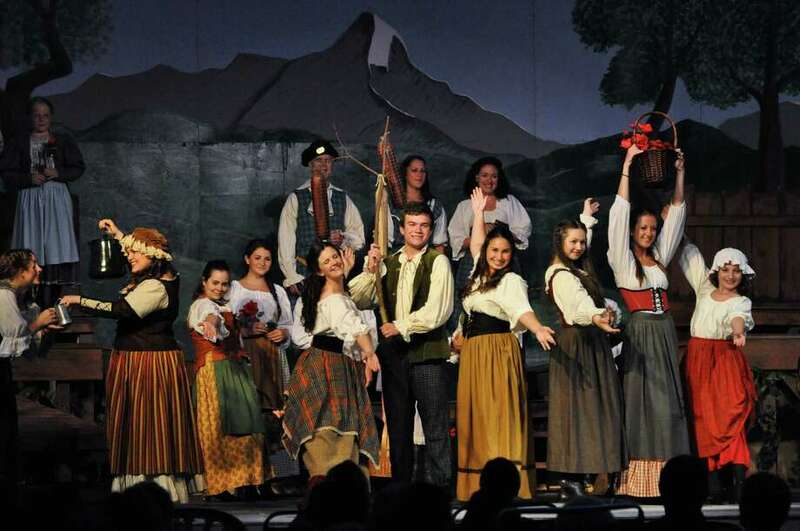 In the long history of summer musicals at Richter Park in Danbury, there's one special moment that stands out for audience members and actors alike. They call it the "Richter Magic." It happened during a performance of Guys and Dolls at Richter Park. The sky opened up just as the performers began to sing "Sit Down, You're Rockin' the Boat." The rain continued for the durationof the song but no one in the audience made a move for their vehicles. Some opened umbrellas. Some didn't even do that. They stayed to enjoy the performance. As the song came to an end so did the rain. "It was 'Richter Magic.' That's what we call it," said Lauren Nicole Sherwood, artistic director of Musicals at Richter, Connecticut's longest-running outdoor theater program. That's the most obvious in a long line of magical theatrical moments that the audience and actors have shared under the stars every summer since 1985 when founding artistic director Bradford Blake mounted productions of Little Mary Sunshine and Once Upon a Mattress. In the past 31 years, Musicals at Richter has offered three musicals every summer. Performances have included everything from Broadway classics such as My Fair Lady, South Pacific, Fiddler on the Roof, and West Side Story, to more contemporary fare such as Into the Woods, Children of Eden, Once on this Island, and Hairspray. The 32nd summer season will include main stage productions of Hello Dolly (June 10-25), Footloose (July 1–16), and Joseph and the Amazing Technicolor Dreamcoat (July 22– Aug. 6). Workshops will perform The Little Mermaid Jr. to close out the summer season with a group of performers ages 8 to 16. As in past years, the Fairy Tale Theater productions will be directed and adapted by Elyse Jasensky, who portrays Mother Goose. She sometimes gets input from her students, who are also the performers. "It's performed for kids by kids," Sherwood said. There are also children's crafts. Fairy Tale Theater started with performances on the back porch of the Richter house but Fairy Tale Theater productions are now held outside at Wooster School – unless rain necessitates the performances to be moved inside. Sherwood said some performers return year after year to audition because of the close bond that is formed, and often parents and their children perform together on stage in the same show. Janie Matson, director of this year's Joseph, is a Richter alum. And Sherwood has performed in leading roles there, including Rosie in Bye Bye Birdie before assuming her current starring role as artistic director three years ago. "You become part of the Richter family. Whenever you come back you feel like you've never been gone. Everyone is there for the love of theater," she said. And that includes the audience so Sherwood recommends arriving early to claim a place when the gates open at 7:15 p.m. Performances begin at 8:30 p.m. because they have to wait for the natural light of the summer sun to dim before they can employ the theatrical lighting. Ample parking is available. Patrons are invited to bring a picnic dinner or order takeout from Café on the Green. Golf cart trolleys are available to help carry coolers. For information and tickets visit www.musicalsatrichter.org.